From soy to almond to quinoa, there’s a wealth of non-dairy milk alternatives to choose from. It’s confusing knowing what to buy. If you’re not drinking cow’s milk due to intolerance or other reasons, finding a milk alternative can be confusing. There is a plethora of milk alternatives available, and each variety boasts different health benefits. When choosing a new milk alternative, the most important thing to ensure is that it is fortified with calcium. Dairy foods are our most important source of calcium, so this is a priority when finding dairy alternatives. To see if a dairy-free milk is fortified with calcium, check the calcium amount in the nutritional table to ensure there is at least 100 mg of calcium for every 100 ml of liquid. 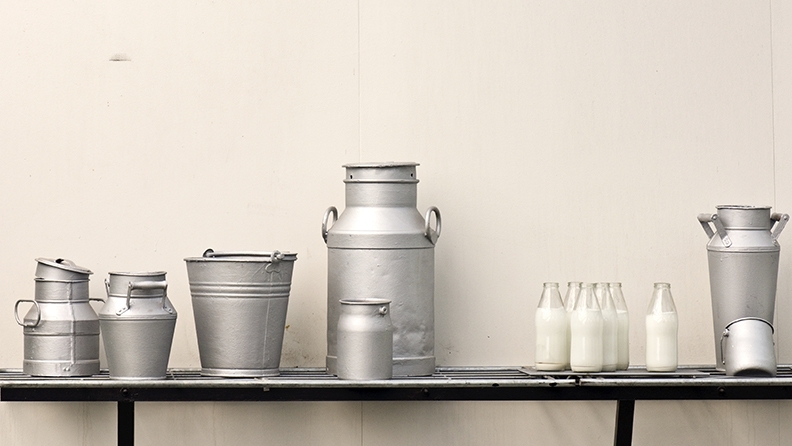 Here are six of the most common dairy-free milks and how they stack up when it comes to flavour and nutrition. Almond milk is made from finely ground raw almonds and water, and it has a mild, nutty flavour with a creamy mouthfeel. Most almond milk products will have sugar added to it, so it can be a little sweet too. While it’s high in antioxidant-rich vitamin E and low in fat, almond milk contains less protein than cow’s milk. However, it’s a better source of protein compared to rice, oat or quinoa milk so if you are looking for something to keep you full, nut-based milks are a better source of protein. Some supermarket brands contain added sugar, so check the label and go for the unsweetened one if using in savoury products. A viable milk alternative with some nutritional value. Check there is no added sugar if you are using in savoury dishes to prevent a sweet taste. A lot of enthusiastic cooks are now making their own almond milk at home. Just be aware that there won’t be anywhere near the level of calcium in homemade almond milk compared to the fortified products, so make sure you are still getting your calcium in. Coconut milk has an amazing flavour which lends itself well to both sweet and savoury dishes. The coconut flavour will add a strong flavour to the dish so ensure you like the taste. It adds a great tropical feel to any dish, especially when paired with other tropical flavours (think pineapple or mango). Although the word milk implies it’s interchangeable with cow’s milk, it’s not. While coconut milk may look like milk, but that’s about where the likeness ends. Coconut milk is high in saturated fat and kilojoules so it shouldn’t be considered an every day food. This milk doesn’t contain calcium either, which is a big minus. Coconut milk is quite high in saturated fat – even the ‘lite’ versions, so use sparingly. It’s not advisable to have coconut milk as a replacement for cow’s milk because of its saturated fat content and lack of calcium. If you enjoy the flavour, try Vitasoy’s new coconut milk which still has all the flavour of coconut milk, but includes calcium and islow in saturated fat. Oat milk has mild oaty flavour (think porridge). It’s not as creamy and thick as some dairy-free milks, it feels quite watery in the mouth. Oat milk contains a type of fibre called beta-glucan, which can help lower cholesterol. Like other grain-based milks, oat milk is low in fat. However, if you’re sensitive to gluten, it might be best to give this one a miss. It’s also low in protein so it’s not as filling as other options. As with most dairy-free milks, it can have sugar added to sweeten it, so ensure you opt for sugar-free if used in savoury dishes. Oat milk is good for those who have nut or soy allergies. Avoid using in recipes which require thickening (custards and thick sauces), as the oat milk won’t thicken very well due to it having lower amounts of protein. Give it a go if you’re looking for something to help lower cholesterol. Quinoa has a distinct flavour – mild and quite nutty, and the milk tastes the same. It’s quite watery and thin so don’t expect it to provide too much flavour to your food. Quinoa milk is similar to rice milk in terms of nutrition. It contains very little protein (0.05%) so it won’t be as filling as other milks. Quinoa is one of the newer dairy-free milks being sold, good for those who have cow’s milk and nut allergies and don’t like soy. It’s pretty low in nutrition compared to its cost, so it might be best to use this in conjunction with other dairy-free milks. Rice milk has a very mild delicate flavour and it’s quite sweet. Its sweetness comes from the processing of the brown rice that it’s made from. It has a thin, watery mouthfeel and overall it won’t pack much punch to your dish in terms of flavour. Compared to cow’s milk, rice milk is quite low in protein (0.3% protein compared to 4%), so don’t rely on it to fill you up. Look for a product with added calcium to keep those bones strong. Rice milk is a good option for those trying dairy-free milks for the first time as it’s quite palatable. Also, rice milk is the most hypoallergenic, so it’s great for intolerances and allergies. It’s quite low in protein, though, so avoid using in recipes which require thickening (like custards and thick sauces), as rice milk won’t thicken very well due to its low protein content. It can be quite sweet so it’s best not to use with savoury foods, and it’s also fairy costly. If you are choosing rice milk, choose a brand that has been fortified with calcium. Soy milk has quite a distinctive flavour, which isn’t unpleasant but takes a little getting used to. It has a thick, creamy texture similar to cow’s milk. There is a lot of variation in flavour and texture between brands so experiment and try a few. Most dairy-free milks have sugar added, so go for an unsweetened version if this is a concern. Soy milk is the most nutritionally comparable to cow’s milk and has the highest protein content of all the dairy-free milks, so you will still be getting a healthy dose of protein and good fats in each serve. One of the most common non-dairy sources, soy milk is a good swap. It contains the most nutrition of all the dairy-free alternatives, and is also the most widely available. Soy is a good all-rounder. Use in place of cow’s milk, in cold and hot dishes and in baked goods. Just watch it in coffee as it can curdle – not nice! What’s your favourite moo-free juice? Have you tried one I haven’t written about? Previous Post Food trends: Charcoal infused juice.